Every year in spring mystical Jews do a seven-week daily meditation. It’s multi-dimensional tour of aspects of divinity and self called The Counting of the Omer. The practice stretches between two major sacred festivals. First, Passover, commemorating the exodus from Egypt (“the narrow place”), but more symbolically about leaving places of constraint. Think about a momentous life shift, like divorce, or a healing crisis. It’s about moving into a new and better you. Forty-nine days later comes Shavuous, Sinai, being in the divine presence and taking it in through every pore of every incarnation. 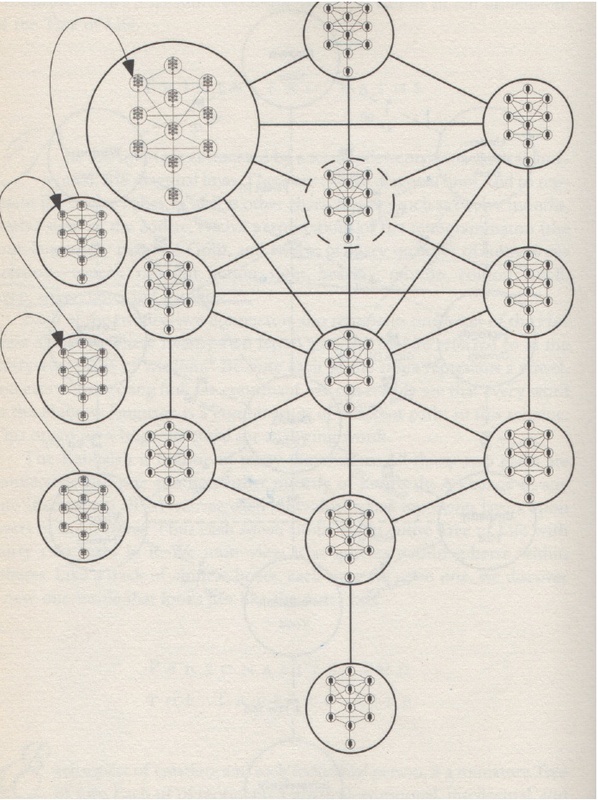 Tree of Life in Judaism refers to the symbolic tree of creation and to a paradigm of how to look at the world. The Tree is a set of stacked triangles that operate in triads: a characteristic, its opposite, and a balance point. They’re traditionally represented as spheres, called sephirot. The bottom seven are a strong and useful paradigm to use for solving any personal issue you’re wrestling with, aka getting out of a narrow place. The first triangle is about unconditional love, discernment, and compassion. For an example, in relationship terms, think about: I love you madly forever; I need more boundaries, space, and time; Let’s work out something that’s good for us both. The names of these spheres are chesed, gevurah, and tipheret. The second triangle is about your life force: What energizes you? How and where do you aim it? What’s possible? In creative terms, it’s your Eureka! moment; your final draft/exam/signature/etc; and the possibilities that open up come from becoming an author/doctor/homeowner/whatever you’ve been striving to manifest. 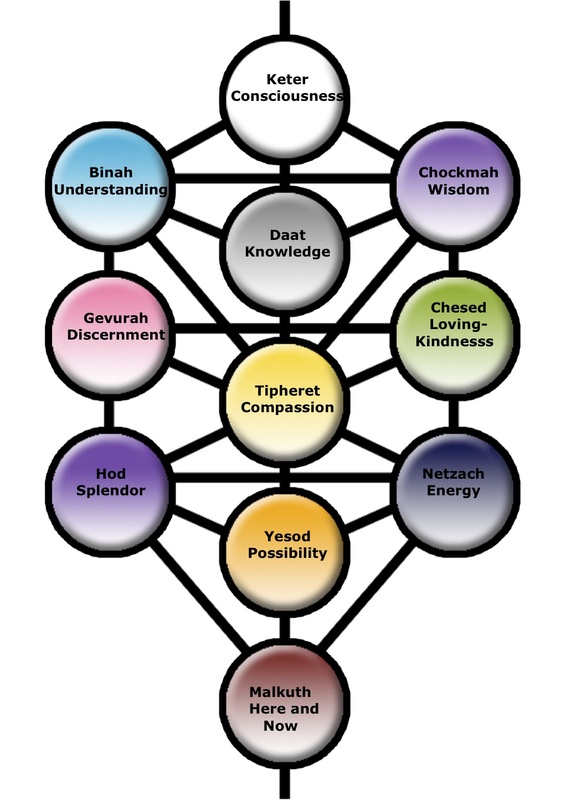 The spheres are netzach, hod, and yesod. The seventh sphere is malkuth, the kingdom of here and now. This reality. How you pull all that powerful everything into the day-to-day of this life you’re living. Week 1, which starts Tuesday April 15 at sundown, is a week of meditating on chesed. How you are open, generous, expansive, giving, and filled with love. Every Tuesday at sundown for the next six weeks is committed to each successive trait. The holographic path has circuits of each sphere within the primary trait of the week (7×7=49 days). First you think about how loving you are, then why it’s good to have some boundaries, how to set them with grace,….and so on daily, through each trait. You can Google for daily meditation prompts from various perspectives, or ask and listen to your heart for questions as well as answers. I recommend naming/numbering journal pages with the traits before you start, because it’s easy to slip behind and harder to get back in queue. This is a practice very worth doing, especially if you can identify one issue that you’ve been grappling with and feel like you’re stuck in a repetitive cycle that’s not leading you forward. You may not get to goal, but you will almost certainly get new insights and ideas about how to change your perspective and behavior. So just for fun, starting bedtime Tuesday, think about how you are giving, loving, open, generous, and kind, in all the aspects of the Tree of Life, and see how it changes your now. Then work your way through each trait. There’s no way around dealing with a word that I was two years into my return to Judaism before I could comfortably say: God. G-d. Or, as I prefer, HaShem, The Name. My own cosmology is complex and always evolving. I also don’t think this concept communicates easily, even among seekers and mystics. So this post is simply an attempt to say that the idea of Spirit is important but also elusive. The questions pervasive and the answers hard to wrap your hands or brain around. Whether you believe in what Hindus call leela (cosmic play) or what quantum physics might describe as the Higgs Boson particle, most folks are either believers in some unifying energetics or dismissive of the concept. A person of faith or a questioner of the intangible. That’s between you and you. In Jewish liturgy and songs, there’s many names for the concept of a deity, both the subject and object of prayer: The One, The Creator, Source Of Life, The Life Of All The Worlds, Shekhinah (the sacred feminine godhead), The Holy One, The Eternal, The Radiance, The Omnipresent, Giver of Words, The Just One, The All-knowing, The Infinite, for some examples. (Yes, I’m intentionally skipping, at least for now, the angry wrathful ones.) They all subsume into the abbreviation God. Abraham Heschel has a wonderful description of what he calls the ineffable: To meditative minds the ineffable is cryptic, inarticulate: dots, marks of secret meaning, scattered hints, to be gathered, deciphered, and formed into evidence; while in moments of insight the ineffable is a metaphor in a forgotten mother tongue. Amen. I can’t say it better than that. That’s what I mean by HaShem: the thread that ties it all together in this story we call life. And that’s how I’m going to use it in this blog. Feel free to substitute whatever works for you. Mystical Judaism draws from the idea of a holy spark within each of us. This informs my daily life, my spirituality, my writing, and my art. 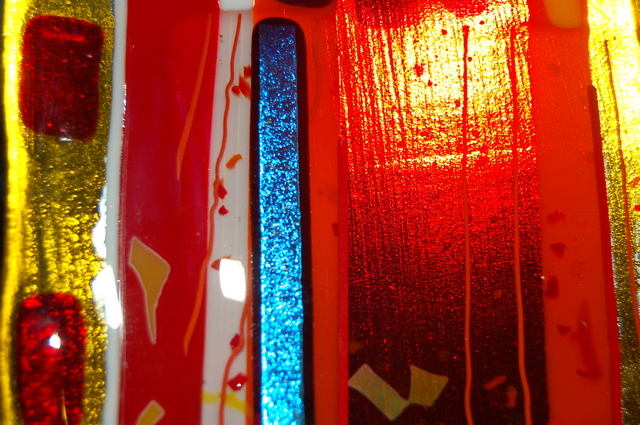 In a blog starting Oct 9, I’ll share thoughts about what the weekly Torah reading means for living with greater happiness, direction, wisdom, and compassion. It’ll combine ideas for soul wrestling, suggestions for meditations, and prayers for blessings. I’ll also write about everything from creativity to joy, and all the energies that motivate and elevate us. I hope the words and images will speak to you. That you’ll let them rumble around your heart and brain, and then listen to whatever they evoke. Like each of us, this is a work in progress. I hope it touches you in some way. You can start here are read in order, to see what 2.5 years of blogging produced, twice round the Torah and ending in spring, 2015 with the counting of the omer, click on the Blog tab above and work your way backwards, or search for specific subjects or readings. If you’re a FaceBook regular, please accept the upcoming kabbalahglass friend request. If not, please visit kabbalahglass.wordpress.com and subscribe.